In my work with couples I use an attachment based approach. This is called Emotionally Focused Therapy for Couples, or EFT. It is a proven effective treatment for healing couple distress and strengthening attachment bonds. Emotionally Focused Therapy for Couples is being used with many different kinds of couples in private practice, university training centres and hospital clinics and many different cultural groups throughout the world. These distressed couples include partners suffering from disorders such as depression, post traumatic stress disorders and chronic illness. I am listed on the approved EFT list of therapists on the International Centre of Excellence for Emotionally Focused Couples Therapy website: http://www.ocfi.ca/cgi-bin/eft/search. I have an on-going commitment to building my EFT skills. I have one-to-one supervision using tapes of my work with couples with Dr Rebecca Jorgensen, who is Director of the Training and Research Institute for EFT at Alliant University, San Diego. I also contribute to peer-led tape watch groups under the supervision of Dr. Jorgensen and with colleagues. For couples who live outside of New Zealand, or who are based outside of the Bay of Plenty, there is the possibility of therapy via Zoom. Please email me to discuss. ﻿﻿﻿There is also the possibility ﻿﻿﻿of Therapy Intensives for couples who wish to travel to the Bay of Plenty and stay for two to four d﻿﻿ays. ﻿﻿Couples then attend therapy on a structured basis across the two to four days. 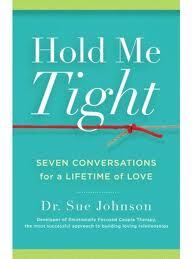 This excellent book, written by Sue Johnson, outlines the basis for EFT Couples Therapy.